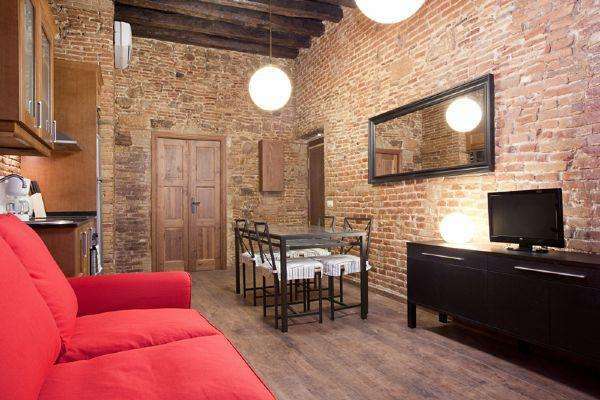 This pleasant one-bedroom apartment in Barcelona, located in El Born, is the ideal choice. Situated in this historical neighborhood, you will find yourself surrounded by boutiques, bars and cafés that line the picturesque streets. Get lost in these quaint alleys and scenic passageways as you enjoy your time in Barcelona. Located in close proximity to the historical sights, many beaches and the famous Las Ramblas, you will have the city at your fingertips. This apartment can accommodate up to four people. The apartment enjoys a mix of modern and rustic elements, while the parquet flooring, brick walls and French windows, which allow natural light to shine through during the day, all adding to the traditional ambience of this space. The living room is furnished with a comfortable double sofa bed, and a TV. An Internet connection is also available, making it easy to stay in touch with friends and family. The kitchen, though compact, is well equipped. The bedroom has two single beds, which can easily be made into a double. The apartment has one bathroom fitted with a walk-in shower. This charming apartment, complete with heaters and air-conditioning as well as access to a balcony, is the ultimate choice.